This spooktacular model carries on with the Halloween theme for the month (yes, I am being that cheesy). 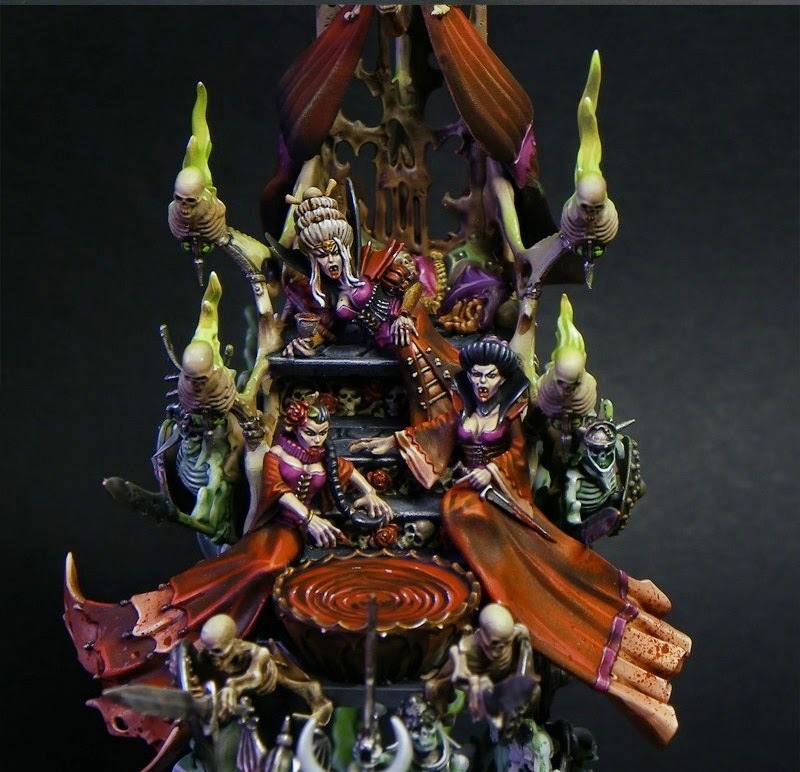 I have always really liked the Mortis Engine and Coven Throne, there is just something about them that hits all the right notes for a large Vampire Count center piece. Surprisingly it was hard to find many high ranking versions of those models on CMoN. This one stood out to me as particularly good though. For the most part it is painted as you would expect, but to a very high standard. This is pretty impressive when you think about how many intricate and detailed parts are on this model. I really like how they used green as the compliment to the red of the vampires. By skewing the greens to either the white or yellow side of the spectrum, they have avoided the dreaded Christmas look. This is a daunting task for painters to overcome when working with these two colors. On the Vampires themselves I like the use of purple, which is different enough from the reds to not get washed out but still similar enough that it falls with the correct color spectrum. There isn't much more to say about this model since there aren't any crazy conversions or anything, but, man, did they do a great job of painting it. Judging by the lack of top level paint jobs for this model, I have to assume it's too intimidating of a task for many painters out there to tackle, but Karpunk stepped up to the challenge and succeeded. Did you the blood splatter on their dresses? Perfect. What do you think of this model? If you have any models or have seen any around the web that you feel deserve to be the Mini of the Week feel free to send them to me at mengelart@gmail.com with the title "Mini of the Week" and a brief description of how you painted or a link to where you found it.